Congenital Heart Defects kill more children each year than all forms of childhood cancers combined. There's a photo I come across on social media quite often which asks which CHD is the worst? The one that your child has. My Timehop for the past few weeks has been photo's of Martha Grace as a baby. You know, the lovely 8 - 12 week age. 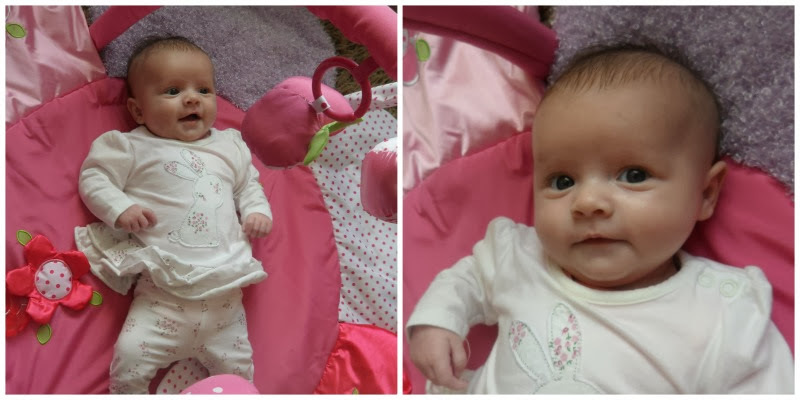 Where she wasn't a tiny newborn anymore, she was just beginning to smile and make giggly gurgly noises. She was the daintiest, most dinky little baby I'd ever known. I look at this photo of her on her playmat, her beautiful smile and perfect skin and I feel so sad but also angry at the same time. The 3-5-month-old baby stage that we should have enjoyed at home as a family, was spent in a Hospital instead. Her teeny tiny body being ravaged by various procedures and drugs. Instead of snuggling my last baby, I had to make do with stroking any area of skin not covered in wires. Having to ask for help to get her out of her cot for a cuddle because I couldn't manage to manoeuver a baby and all those wires on my own. The smiles that I'd only started seeing in the weeks leading up to her the operation quickly disappeared. Her face covered in tape keeping her ventilator and feeding tubes in place. A baby that eventually became addicted to morphine and needed a weaning regime to help her cope with coming off it. The baths she should have enjoyed, splashing and learning to lay with toys ended up being a quick sponge bath on an incontinence sheet so stop her bed from getting wet. Her first Christmas which should have been spent with her brother and sister and the rest of our family was actually spent just the three of us, Great Ormond Street Hospital was serving Christmas Lunch free of charge for families that day. Martha Grace was 5-months-old when we finlly got to bring her home. She couldn't manage a full feed orally and needed help for an NG tube. There was a whole list of meds timetable that we needed to stick to. It was almost as if I was her carer, not her mum. I am grateful every day that our journey so far have given me a 5-year-old who enjoys a great quality of life. But when I watch TV shows like "Emma Willis, Delivering Babies", I realise that I missed out on a massive chunk of Martha's babyhood. I lost out on the amazing baby days when it was the last chance I would ever experience them. I resent CHD for that.